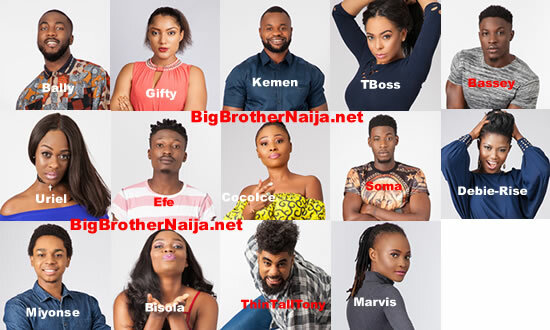 Five housemates who include Nina, Miracle, Cee-C, Tobi and Alex have made it to the Big Brother Naija Season 3 Grand Finale. 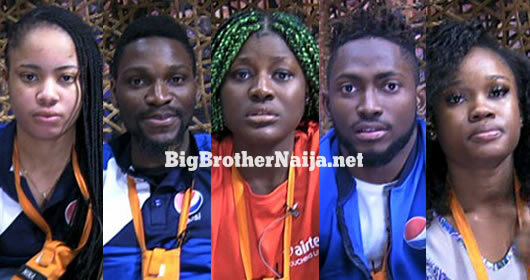 Remember that three of the above mentioned housemates booked places in the finale as early as last Monday , these are Alex, Tobi and Nina while Miracle and Cee-C also booked places in the finale after surviving last night’s eviction. So this week being the very last of Big Brother Naija season 3, our finalists Cee-C, Miracle, Nina, Tobi and Alex are all competing for the grand prize of ₦45 million plus a brand new suv and we would like you to tell us which housemate you want to see crowned the winner by dropping a comment in one of our comment boxes below. See What Efe Did After Saturday’s Party – The Poor Birthday Boy Only Tried To Be Human!! I'm voting for Tobi Bakre to win the grand prize of 45 million naira. My King Cee-C 4 the money! I am voting Alex, she needs the money to further her studies and help her family, she needs money more than her housmates who are already established. I AM VOTING FOR Cee C. She is a survivor and she deserved the money. Cee-C, the ultimate survivor of course! Cee-C the bold, strong independent woman! That money is yours, in Gods name babe! Keep being yourself, with Gods help, we will vote and vote for u and leave everything else to God!! Miracle for the money,intelligent,bright,humble,team player and lover of all.Crown the young pilot …..Igwe of BBN 2018 season3. Miracle Miracle and Miracle …the young pilot has proven himself capable of utilizing the 45m. Miracle for the money . Alex for the money. Ceec is too arrogant and she is very undermining and a liar. She is a survivor and she she can still survive. she is a lawyer but she couldn't really tell what she would do with the money if she wins. remember she once said she can make the winning money in a weeks time, to me she is boastful and does not deserve the money it is not about surviving is what about how you played the game she played a victim in the house, always arguing with the housemates. Big brother and the voters let us give the money to a deserved person Alex if the more has to be won by a women. let us save a life her father and her family needs the money more than Ceec. After yo Alex proved to b fake Im sure ull respect Cee-C. On Sunday, she accused Cee-C of hating her because of Tobi insisting 2 b friends with him. Because Cee-C is ever ready, she gave her a clap back. On Monday, she told biggie that they r happy, she hates Cee-C she brought all whats happening to hersrlf but did she forget who biggie is? Biggie made Cee-C the hoh. The same Alex u r praising could not even say Cee-Cs name. On Tuesday, during the day, she comes up with a fake apology, still claiming to b Tobis friend. Do u think Cee-C is a fool? She goes 2 biggie telling him that she apologised even though she did nothing. Now, do u blame Cee-C? Did u hear Cee-C saying anything abt the apology in her diary session? No , because Cee-C has better things to worry & talk yo biggie abt, not movies. That girl Cee-C is a genious! Wait wait, did u sea Tobi & Alex having s×× midnite? Now who is a fool? Just leave Cee-C alone & campaign 4 yo favourite hh.pls Cee-C 4 the money! All of you that brought hate, sexism and feminism into this stupid big brother game that we are using to waste our time till elections start are high. All of you exception of none.. A woman deserve to win?? And you let Ifuennada out of the house, you let Anto out of the house?? People hate a housemate, are we supposed to like everybody, I do not like Alex her dancing annoys me. She reminds me of Heaven Festac do you see me talking about her or all the rest I do not like?? Nigerians hate feminists, and we let the hustling feminists that embodies gender equality go, you let Ahneeka and ifuennada go and you are talking about feminism?? Miracle will win that money because he is the only person who for 85 days never gossiped about his fellow housemates, who never talked down on anybody and respected everyone, who never insulted anybody for one second or used foul words on anybody during Altercations. Miracle put in 100% in every task and actually positively influenced his fellow housemates. Let us be real now.. The phrase is " May the best man win the game" it is not okay to compensate some brat with zero value delivery. Next year, 5 women will come into the house forming rude and obnoxious because it seems like the way of life. We are not going to be telling our young girls it is okay to be rude and offensive. God hates nasty. No matter who wins on Sunday , we are not going to tell " the average nigerian" being offensive is the new strong…… Amandocracy is still the government style of the day.